The New Jersey US Senator is calling around letting people know he’s in the running…. This follows California Senator Kamala Harris throwing her hat in the race recently…. 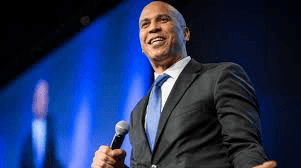 Booker is in the second tier of candidate right now and maybe in a tussle to try and grab a good amount of the Black vote from Harris or Obama Vice President Joe Biden if he runs…. A Booker spokesman declined to comment for this story. Booker’s entry into the 2020 Democratic presidential primary race was widely expected, but his announcement on the heels of the successful presidential launch of Sen. Kamala Harris (D-Calif.) suggests he and his team realized he could not allow his Senate colleague and fellow CBC member build too much momentum, some Democratic observers said. Sen. Cory Booker (D-NJ) has raised $5.1 million in the two months since he announced his 2020 plans, the Washington Post reports.